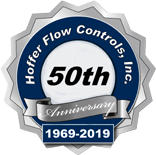 There is only one clear choice for every critical, complex flow measurement application in the offshore drilling, production and well-servicing environment: Hoffer Flow Controls. The HO Subsea Flowmeter Series provides users with multiple features and benefits that are unavailable from any other flowmeter company. With more than 40 years in the flowmeter business, we continue to set the standards for accuracy, reliability, durability, economy and integrity. In fact, no other company offers you more flow measurement solutions for subsea flow applications than we do. Put us to the test, and find out how Hoffer turbine flowmeters can resolve your challenging subsea flow applications. Operating depths to 20,000 FT or more. Robust flowmeter internals built to meet Military standards for high shock (MIL-S-901D) and vibrations (MIL-STD-167-1) requirements. A flowmeter with a response time measured in milliseconds. Flowmeter “housing” is typically custom designed to fit into the customers existing footprint/space. Designed to withstand the temperature/pressure extremes of a subsea environment. Flowmeter design includes integral flow straighteners. Wide flow range capability is ideal for subsea applications. 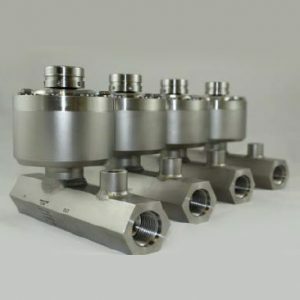 Flowmeter housing can be designed with a wide variety of end connections including GraylocR, TechlokR, ANSI, NPT, MS, DIN and many others. Subsea connectors are installed in unique “riser” design on flowmeter housing. Design and construction compliance to API6A/17D when required. A variety of construction materials are available including 316, 316L, Nitronic 50 and 60, Duplex 2205 and others. ABS-CDS, DNV, Lloyd’s and other certification compliance available. Multiple electronic outputs and interfaces available. BOPs, ROVs, wellhead additives, subsea production systems and a variety of other subsea flow applications.